Lake Ashuelot is over 350 acres located just northwest of Concord in Washington NH. This waterfront year round home is on the lake! Load your friends from your own dock for a day of water-skiing or tubing. This 3 bedroom 2 bathroom home has plenty of room and to top it off an oversized two car garage with 2 heated rooms above for guests or just storage. Newer light bright kitchen, large pantry closet, bamboo floors, double sliders to deck, updated baths, large master, First Floor bedroom with walk in closet. In the winter you can spend the afternoon in front of the fireplace or ride your snowmobile from the front door to Sunapee Ski area. By car Sunapee is just 35 minutes away. Listed by Manning Williams Agency. The association has tennis, basketball and a play ground for kids of all sizes along with a great sandy beach. You at the lake and in the woods all at one location. 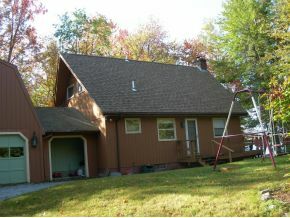 For additional information on this home call Lady of the Lake Realty at 1-888-737-5550 or e-mail at info@nhlakesrealty.com or visit our website to view similar lake homes in New Hampshire at www.nhlakesrealty.com or www.lakeorskirealestate.com Contact us today to see if this home is still available? ?